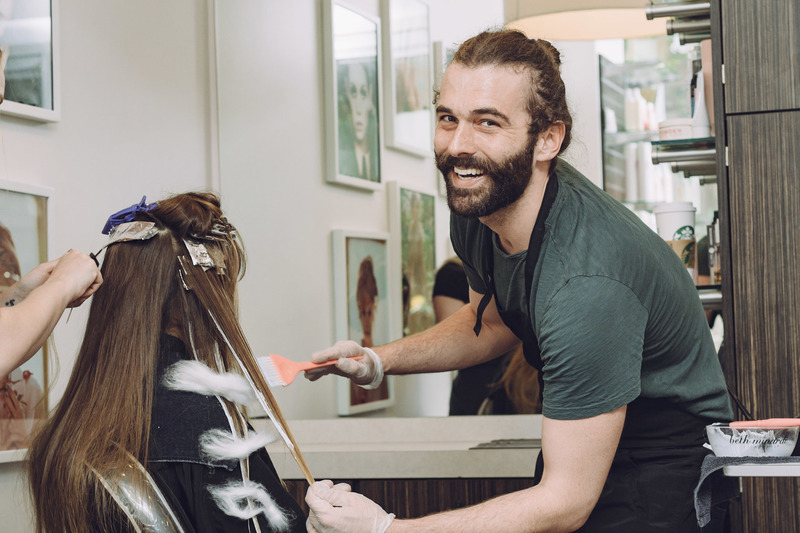 Queer Eye’s breakout star Jonathan Van Ness has been a busy bee since joining the Sola family five years ago. His Funny or Die series, Gay of Thrones, in which Jonathan delivers hilarious recaps of every episode of Game of Thrones was nominated for an Emmy in 2016. He’s also been turning out entertaining and deeply insightful episodes of his weekly podcast, Getting Curious with Jonathan Van Ness, since 2015, in which Jonathan explores things he is curious about ranging from the Armenian Genocide to what it’s like being a fashion model. Between creating and producing an absolutely hilarious web-based series, recording a podcast, filming two seasons of Queer Eye (with a third on the way!) 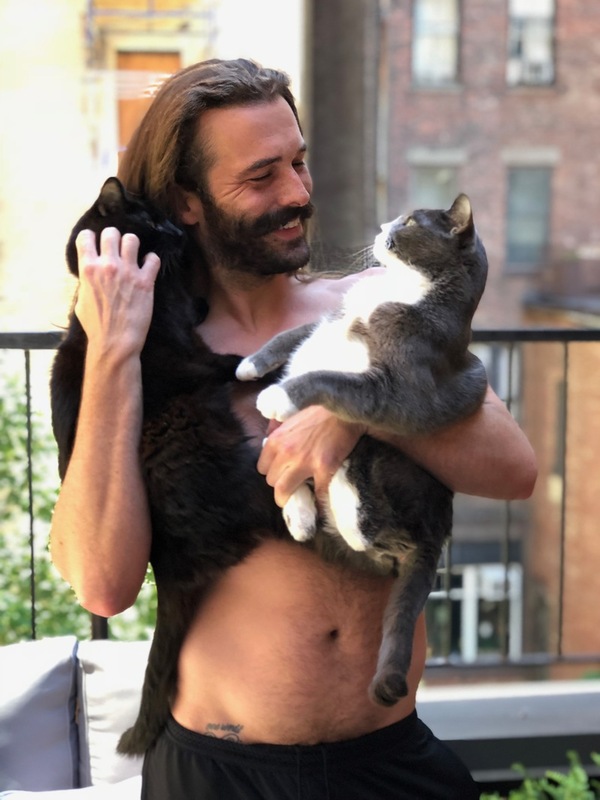 and owning and managing his own salon, it’s amazing to follow along his Instagram stories to see that he still has ample time for self-care and raising his two gorgeous cats. 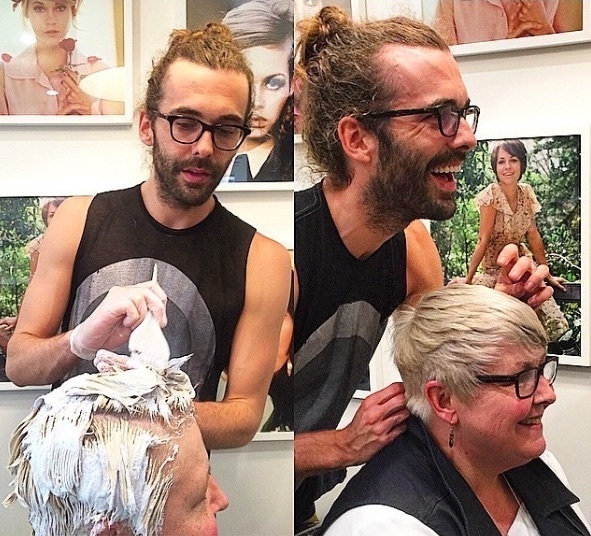 He chatted with us about the joy of owning his own salon, being nominated for an Emmy and that day he gave his mother’s vintage Barbie a makeover. SOLA: Before you became a “one-man meme machine” on Queer Eye, you were coming up with spirited recaps of the latest episodes of Game of Thrones, which sparked the idea for the original web series Gay of Thrones on Funny or Die. How did you get that gig? JVN: I had a client named Erin Gibson who worked for Funny or Die. We actually became friends. I think I can count on one hand the clients I’ve become friends with. Sometimes there are weird boundaries and you’re not sure if you should really hang out with them. It’s almost like running into your school teacher in the grocery store when you see them in public. Anyway, Erin saw me talking about Game of Thrones and said that we should do Gay of Thrones for Funny or Die. I had no idea what went into production or comedy, but she went into Funny or Die and fought for me, a hairdresser who was not a comedian and who no one knew. She created an opportunity for me. She introduced me to a world I never knew existed and showed me that I had so much strength inside myself I didn’t know I had. SOLA: What was it like when you learned that Gay of Thrones was nominated for an Emmy? JVN: It was super surreal; so exciting. It’s amazing to have your work recognized on that level. It was beyond. SOLA: When did you decide to become a hairstylist? 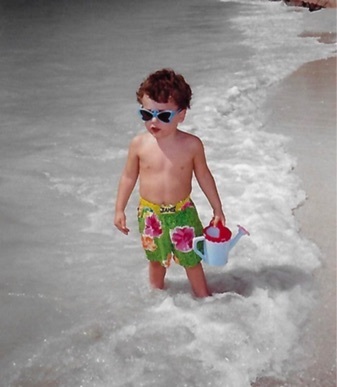 JVN: When I was three. My mother had these vintage Barbie dolls. There were six of them, and I took them all into my closet where I planned to cut their hair. I remember that I’d taken all my clothes off the rack in the closet and had pulled the bar down about six inches, so I could do gymnastic moves on it. There was this one Barbie with white-blonde hair. I had just finished her when my mother walked in on me. Let’s just say that she was not happy. It’s kind of ironic since she was the person who sold my Berenstain Bears in an “unauthorized” garage sale. I had to search all over town for my Lisa Barenstain bear because they were so hard to find. It’s what my grandmother—my Mom’s mom—and I talked about on her deathbed - how my mother sold those treasures right out from under me. I watched an Amish family pull out of our driveway in their carriage, and to see their kid ripping open the Lisa Berenstain package, well, let’s just say I would NEVER take Lisa Barenstain out of the package! SOLA: What kind of salon environment were you in before deciding to go out on your own? JVN: I graduated from the Aveda Institute in Minneapolis in 2006 and then moved to Arizona because I was cold [laughs]. When the economy crashed, everyone went from being booked three weeks in advance to twiddling their thumbs in the break room. So, I went to California because their economy was still sorting itself out. I was still drinking that Aveda Kool-Aid and was determined to work in an Aveda salon. Then I discovered Sally Hershberger and “auditioned” to be part of her team. That’s what they call it, and they are not even joking! I worked there as an assistant for a year and a half before moving back to St. Louis to be closer to my family. Let’s just say, I cycled through that bad decision very quickly and moved to back to California where I opened a Sola studio with my good friend Monique Northrop in 2013. I know this sounds controversial, but at some point, you just get sick of giving half of your money to someone else! SOLA: You are getting so much love on Instagram from hairdressers all over the country who are watching you and wanting to go out on their own. Do you have any inspiration you can share with potential Sola owners? JVN: I think people have the idea that you can’t build at a place like Sola. They say you lose 25 percent of your clients every time you move. But don’t let that stop you! You can always build. Maybe there isn’t foot traffic like in a full-service salon, but between Yelp and Groupon, you can do it. 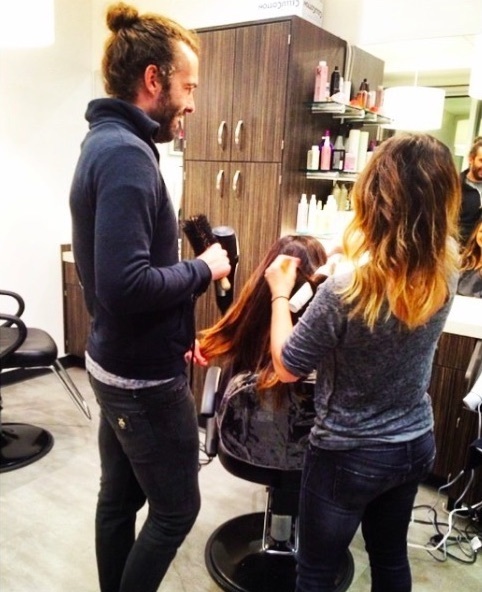 We’ve experienced a lot of walk-ins here in Brentwood. Not having a front desk hasn’t deterred clients. Use social media, be passionate about education, watch tutorials, go to classes, stay inspired. It’s so great not giving your money to someone else. I can’t stress that enough. It’s so great to determine your own hours. You can use your time as you want. When you work for Sola, there’s built-in support. You don’t have to go at it alone. For those reasons, spread your wings and fly! I could never work for a commission salon in that capacity again. I feel like one day I could pop into one and do a class, but I can’t really see myself working for a commission-based salon again. SOLA: Why was being independent and creating your own salon business important for you? JVN: It’s kind of overwhelming when you decide to start a business. How do I know what to do? Doing something like a salon suite provides a roadmap to help you execute those decisions. It’s nice to have parking sorted out for you, a way to obtain insurance without going online. There are so many boxes to click when opening a business and Sola made it easy. SOLA: What are the advantages you’ve experienced by being part the Sola community? JVN: Education is great. It’s so different now. I have the resources Sola provides to find classes in my area and be able to get to them. They offer professional liability insurance. Knowing I was covered if something ever happened to a client was a life saver. If I had to go out and get my own insurance I would have totally ended up with the wrong kind and who even knows what I’d be covered for! SOLA: What advice would you give someone thinking about going into business for themselves like you have? JVN: If you aren’t fully booked and have a fully popping clientele, you have to learn how to use social media. Otherwise you have to have so many business cards and think, drink and talk hair 24/7 because competition is so fierce. I use Instagram. People are starving for authenticity so don’t do generic things like posting what you think people want. Be yourself. Be authentic. 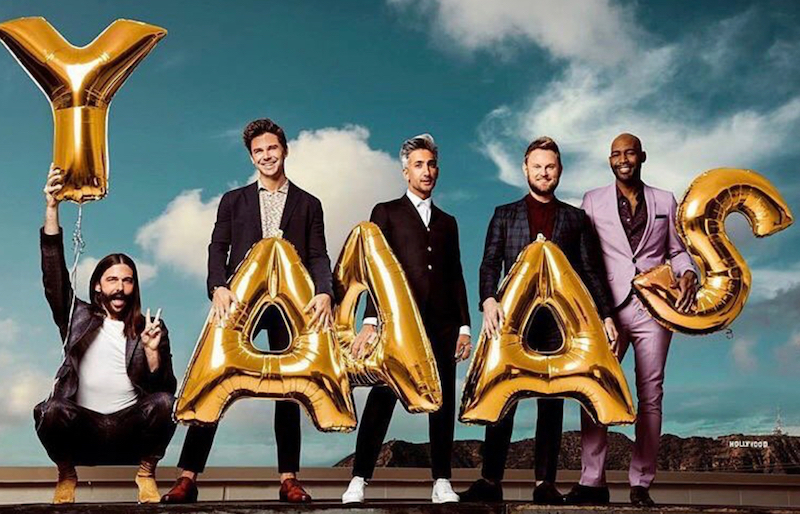 SOLA: Queer Eye creator David Collins has said that he admires you for fighting so hard to be exactly who you are, someone with no sense of body shame, just a beautiful and authentic person. How hard was that to come by? JVN: I don’t know if I agree with that. I do have body shame. What I’ve learned is that we will always have little pieces of insecurity, but the more we can meet those pieces with self-love, the easier they are to deal with. I treat myself with love and compassion and do the things that make me feel good like going to the gym. SOLA: Chris Rock has said that he’s grateful for bullies because the kids they bully grow up to be the most creative and innovative kids on the block. You’ve admitted that you were bullied growing up. Do you agree with Chris Rock’s assessment? JVN: I think there’s some truth to that. A lot of times kids who are severely bullied can’t remove themselves from that situation by changing schools or being home-schooled, but it encourages you to create pockets of joy. Kids can be really mean. I wish we had a world where bullying wasn’t so pervasive. I feel like it’s getting better, and then I look at the divisiveness all around us and I don’t know. I think we could all use a little of that “ask not what your country can do for you” spirit right now. SOLA: What 3 pieces of advice would you give your 18-year-old self? Don’t get frustrated when you learn new things. Be easy on yourself when acquiring new skills. Remove yourself from negative energy quicker. Adopt more cats! I have two cats. Bug is a black cat. I call him Bug because he’s a lovebug. The youngest is a gray and white tuxedo named Harry Larry, but I just call him Harry. I think two cats is the most you can have if you’re single, but if I lived on a farm with lots of land I’d have 75.